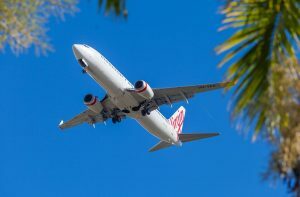 If you are an avid traveller, then you will know just how uncomfortable long haul flights can be. Fortunately, there are plenty of products that can make your journey far more comfortable. One of these is an inflatable footrest. 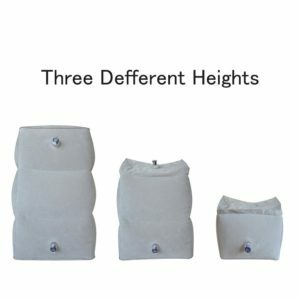 If you have yet to try a foot rest that is inflatable, then you are probably wondering what benefits they offer. There are actually quite a few. Here are just a couple of examples to give you a better idea. Reduces Pressure on your Legs – One of the issues that everyone will face on a long haul flight is the risk of developing deep vein thrombosis. Obviously, this is something that you want to avoid at all costs. One of the ways that you can reduce your risk of developing DVT is to use an inflatable foot rest. More Comfortable – Another problem that you will find with long haul flights is that the seats can often be uncomfortable. This is especially true if you are shorter than average because you won’t be able to rest your feet properly. 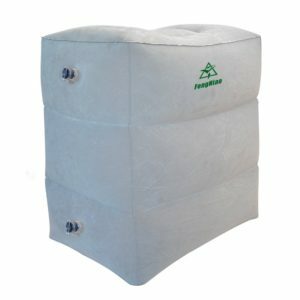 By using an inflatable foot rest you can rest your feet which will be far more comfortable. You Can Adjust the Height – The big issue with plane seats is that you simply cannot adjust the height of them. If you’re a tall person then this is likely not going to be an issue for you, but if you are shorter then it is going to be uncomfortable. 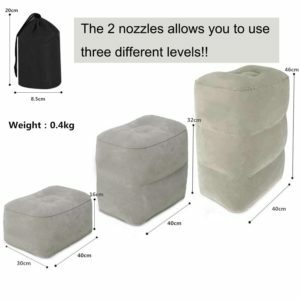 With a footrest that you can inflate, you are able to adjust the height until it is comfortable. 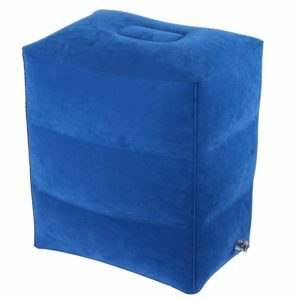 When it comes to choosing the best inflatable foot rest, there are a few things that you will need to keep in mind. One of the best things that you can do is to make sure that you read some thorough customer reviews so that you are able to make an informed decision on which is the best foot rest for you. We have taken some of the work out of this for you by testing and reviewing some of the most popular ourselves. Please see below for our reviews. We hadn’t heard of the Comfort Ninja brand before, so we weren’t really sure what to expect from this inflatable foot rest, especially given its budget price. However, we were actually pleasantly surprised. Comes with a sleep mask. It seemed to deflate a little too quickly. When it came to inflating this foot rest, we had no problems at all. It has two parts to inflate from and they both filled up very quickly indeed. One thing that we really liked is how firm the foot rest is when it is filled to capacity. The PVC flocking material is really comfortable to use, both with or without shoes which is perfect for traveling long distances. 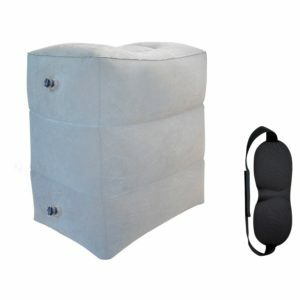 The price range that you can expect to pay for this foot rest is very affordable and the extra sleep mask is a really nice extra touch. The only issue that we seemed to have with this one is that it started to deflate quite soon into the journey. This may be just one faulty foot rest or it might be a common problem. Either way, it was a little frustrating. However, it is a very affordable product so it is worth considering for a one off. AirGoods have a wide range of inflatable travel products on the market at the moment and the majority of them have received very positive reviews so we were expecting good things from this foot rest and we were not let down. The height can’t be adjusted. Upon taking the inflatable foot rest out of the packaging, we were able to inflate it within a matter of seconds. When trying it out, we were really pleased to notice how firm it is. You can tell that it is really supportive, especially on the ankles. One thing that we really liked about this one is how soft the PVC flocking is. Even after using the foot rest for an hour it didn’t feel uncomfortable in the slightest and we didn’t notice it feeling hot at all which you do get with flocking sometimes. The only drawback with this one is that the height of it cannot be adjusted. We felt that it would have been much better if it could be inflated to different heights to accommodate for taller and shorter people. Aside from that, this is a great product. 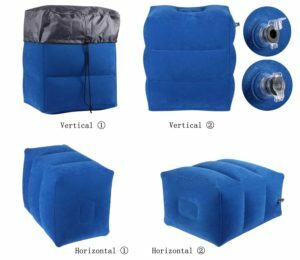 FengNiao produce a wide range of inflatable foot rests and other products designed for making travel more comfortable, so we were really looking forward to trying this one out. We have to say that we were really pleased with this one. Please see below for our review. Our first impressions of this foot rest were great. The PVC flocking material is very soft to touch and feels really comfortable. When we first took the inflatable foot rest out of the packaging, we were a little concerned that it might take a long time to inflate. This was not the case; it took us a matter of minutes to inflate it to the highest level. One of the things that we really liked about this one is that it can actually be used for multiple things. You can either use it as a foot rest, a pillow for your back, or even a comfy bed for smaller kids. It is also suitable for use around the home as well as other long distance travel other than plane. We didn’t have any issues with this foot rest at all. It remained firm throughout our use and didn’t start to deflate at all, which is why we have made this one our top choice. Hopefully now you have a better idea of the right inflatable foot rest for your next journey. Each of these three are great products and well worth considering.